Do you see me? Photo taken in 2007 in Honduras. 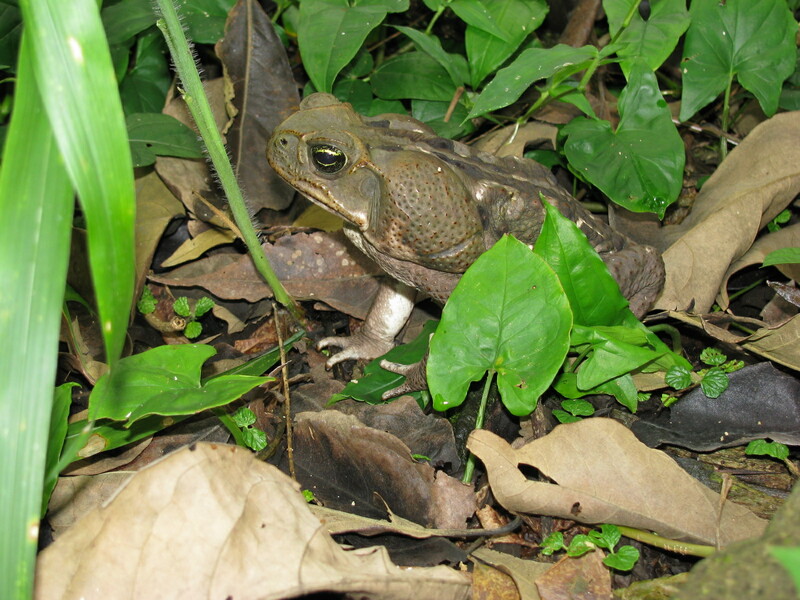 This entry was posted in Travel, Travel Photos and tagged 50 Year Project, Central American Toad, Honduras, Life, Photo, Photography, Toads, Travel, Travel Blog, Travel Journal, Travel Photo. Bookmark the permalink. That is a nice thought. One word describes this photo, Amazing. I found a toad yesterday in our front garden…it was a horrible pink though and not a handsome chap like yours! Weird. I haven’t seen one. I’ve never lived in an area that has toads so it was fun for me to see one. Good capture, it looks huge? It was much larger than I thought he would be. He wouldn’t fit in my hand I don’t think–of course my memory may be faulty. Cute. This is much more visible than the lion yesterday! LOL…this one wouldn’t scare me too much if I wasn’t with a guide. The lion would terrify me. I haven’t seen too many toads in my life. This was a fun find for me. Yes I can see you Miss/ Mr Toad lol. Great shot. He really blends in with the surroundings. Good eye. I probably would have missed him under those very green leaves. Our guide spotted him. I’m amazed by how much they catch. And I’m intrigued by who and what we are missing. He didn’t move much. I think he was pretending to be a statue. That would be my move. I have them in my garden in the summer, I hear them but can’t find them. Lately I’ve been missing the sounds of nature. Where I live I hear people talking, traffic, and tons of sirens. Cool! He’s so camouflaged, it looks like he could easily be stepped on. Fortunately he wasn’t on the path.